"Rich in authentic details, populated with real and fictional characters whose humanity and passion ring true, thick with biting suspense and enthralling intrigue, and brims with originality and fresh perspectives on a heroic era that never ceases to fascinate devotees of historical fiction. Highly recommended!" The Columbia Review. “In Search of Tom Candy” by Dairl M. Johnson is a historical novel in which the journalist son of Edwin Stanton, Lincoln’s secretary of war, investigates a conspiracy involving his father and the president’s assassination. The story mixes fact and fiction in a rich tapestry featuring a young journalist, John Stanton, who happens to be the (fictional) son of Secretary Stanton. Pestering rumors tying his father to the assassination plot, as well as to a mysterious English-American cattleman named Tom Candy, propel young Stanton to quit his job and pursue a story that may, or may not, exonerate his father. The author, Dairl M. Johnson, successfully manages to tell the story on three parallel timelines: the ‘contemporary’ investigation by young Stanton in 1904, the harrowing time of his father’s role during the Civil War, and Tom Candy’s adventurous cattle drive (of a herd of longhorns) from Texas to New York in 1849. This ambitious, large canvas, multi-timeline storytelling works very well in the author’s capable hands, keeping the reader in suspense while providing a tangible feel for life in American during those times. While a few history buffs might protest the Stanton conspiracy premise that’s at the root of this novel as too far-fetched, the author gives it laudable credibility with a solid attention to historical details, indisputable factual anchors in real events, and non-stop suspense that will keep readers captivated no matter what. 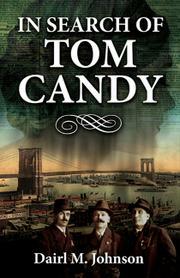 In summary, “In Search of Tom Candy” is a historical novel rich in authentic details, populated with real and fictional characters whose humanity and passion ring true, thick with biting suspense and enthralling intrigue, and brims with originality and fresh perspectives on a heroic era that never ceases to fascinate devotees of historical fiction. Highly recommended!